Banks make money by putting YOUR money at risk. But they don’t share the reward. Don’t Let The Bastards Grind You Down! Inflation has two different meanings. But one word is used because these different phenomena lead to the same result. While No. 10 has insisted that this week's talks with the opposition have been "constructive," the flurry of leaks ostensibly originating from inside the Labour camp have advanced a very different narrative. And now, in the party's first official statement since first sitting down with Theresa May, Labour Shadow Brexit Secretary Keir Starmer has confirmed what many have long suspected: May's refusal to compromise has left the talks on the brink of collapse. 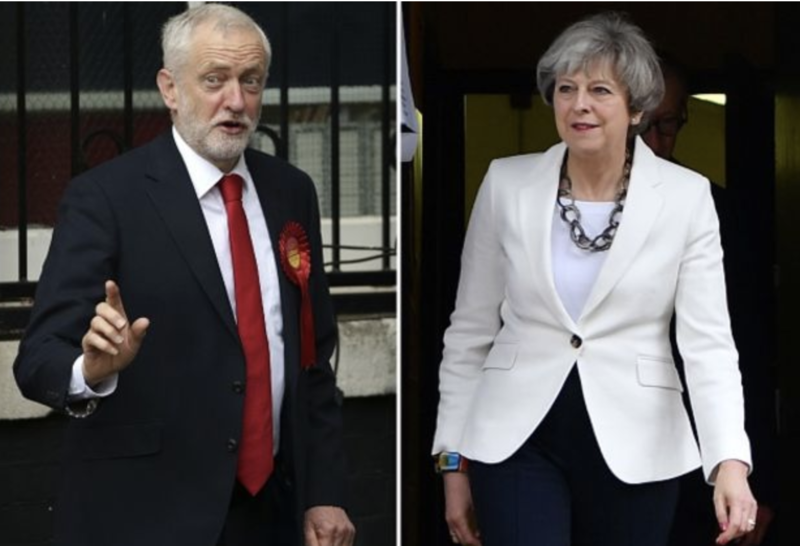 Despite the prime minister's comments about the necessity of working with the opposition to hammer out a Brexit compromise, to hear Labour tell it, May hasn't been willing to cede any ground in the talks. Even stipulations like modifying the political declaration to keep the UK in the customs union - one of Labour's non-negotiable demands - have been rejected by May out of hand. In fact, the prime minister has refused to "come forward" with anything new. Here's more from the Independent. Labour’s decision to publicly criticise the government was prompted by a government refusal to reopen the ‘political declaration’, for a future trade deal, that accompanies the divorce deal. Instead, the Opposition was being asked to merely agree a memorandum that would sit to sit alongside the binding withdrawal agreement. Some Tory sources had suggested Ms May was willing to discuss a customs union – a key Labour demand – or even a Final Say referendum on any deal that emerges. But, speaking after the talks, Keir Starmer, the shadow Brexit secretary, said: "The government isn't proposing any changes to the deal. In particular, it's not countenancing any changes to the actual wording of the political declaration." "Now, obviously, that's disappointing; compromise requires change. We want the talks to continue and we've written in those terms to the Government, but we do need change if we're going to compromise." According to ITV's Robert Peston, the government has also accused Labour of being inflexible. According to Peston, May has proposed a "wrap-around statement" that would deliver some of Labour's central demands, including beefing up protections for workers rights while also giving Parliament a greater say in the next stage of negotiations (when the future trade relationship between the EU and UK will actually be hammered out). What the PM has proposed is a so-called wrap-around statement, that would toughen up proposed protections of workers’ rights, and would give a greater role for parliament as and when the future relationship is being negotiated, including a prior “entrenchment” process to embody whatever kind of future relationship MPs favour within the forthcoming Withdrawal and Implementation Bill. According to Bloomberg's Brexit live blog, the pound is fading as May's strategy in the talks is "increasingly hard to fathom." The pound has been fading all day, and it's correct to do so. It looks as if $1.30 may be a holding level for now, which takes us back to where we were a week ago after almost hitting $1.32 yesterday. That seems about right considering the state of play with Brexit. Theresa May's strategy is increasingly hard to fathom. It's not clear there even is one. 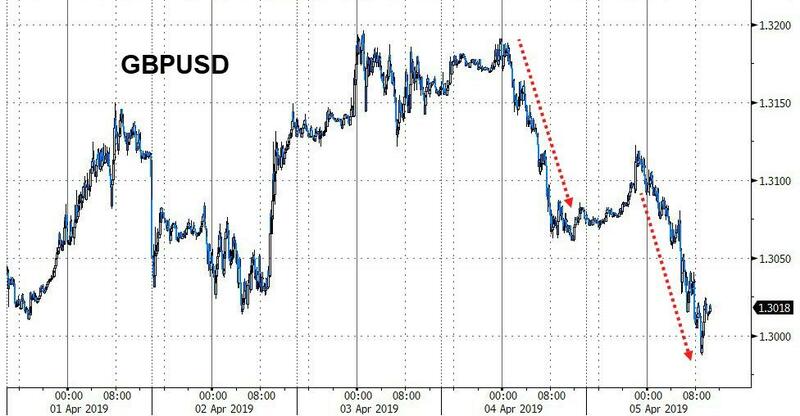 While it's impossible to comment on any swings in the pound, at least in the short term, we're not so sure May's strategy here is so difficult to discern. Consider this: What if May's decision to meet with the opposition was merely a smokescreen? Given her tenuous relationship with the Brexiteer faction of her own party, directly asking for a lengthy Brexit delay would put her in an uncomfortable position. But if the EU insists, then she might be able to accept without losing face. Though some EU leaders have reportedly questioned the wisdom of agreeing to a long-term extension, Peston and others have reported that it's likely - though not guaranteed - that the long-term "flextension" will happen (so called because it would include a provision where the UK could speed up its exit if the withdrawal agreement is passed). With the prospect of a lengthy Brexit delay hanging over the UK's head, May might be able to win over enough Brexiteers and DUP members to pass the deal on its fourth go.